Mailchimp for WooCommerce is a Wordpress plugin that lets you add your WooCommerce customers and their order information to your Mailchimp audience. Use WooCommerce data to track sales, create targeted e-commerce automations, generate custom Product Recommendations, send Abandoned Cart emails, and more. In this article, you'll learn how to connect and disconnect Mailchimp for WooCommerce. This plugin requires you to have the WooCommerce plugin already installed and activated in WordPress. Your host environment must meet WooCommerce's minimum requirements, including PHP 7 or greater. We recommend you use this plugin in a staging environment before installing it on production servers. To learn more about staging environments, check out these related Wordpress plugins. Mailchimp for WooCommerce syncs the customer's first name, last name, email address, and orders. If you decide to use our Order Notifications automation, make sure to disable your notifications in WooCommerce to avoid sending duplicate emails to your customers. Our Order Notifications require Mailchimp for WooCommerce 1.0.9 or later. Our pop-up forms and product retargeting emails require Mailchimp for WooCommerce 2.1.10 or later. WooCommerce customers who haven't signed up for marketing emails will appear as non-subscribed contacts. They can receive transactional emails and be targeted with ad campaigns, but cannot be exported. After your WooCommerce sync is complete, you will have access to Mailchimp’s e-commerce features. To view the e-commerce features supported by this integration, visit the WooCommerce listing in your account. The sync takes about an hour for every 5,000 orders in your store. You'll need to do a few things to connect your WooCommerce store to Mailchimp. Install the plugin on your WordPress Admin site. Connect the plugin with your Mailchimp API Key. Configure your settings to complete the data sync process. To download the plugin, follow these steps. Navigate to the Mailchimp for WooCommerce plugin page. Before you install Mailchimp for WooCommerce, make sure you've already installed and activated the WooCommerce plugin for WordPress. To install the Mailchimp for WooCommerce plugin, follow these steps. Click Choose File to choose the ZIP file for the plugin, and click Install Now. After you activate the plugin, you'll be redirected to its Settings page, where you will enter your API key and configure your audience settings. You've installed and activated your plugin, and are now ready to complete the second half of the setup process on the Mailchimp Settings page. As you move through each step, new tabs will appear with different configuration options. 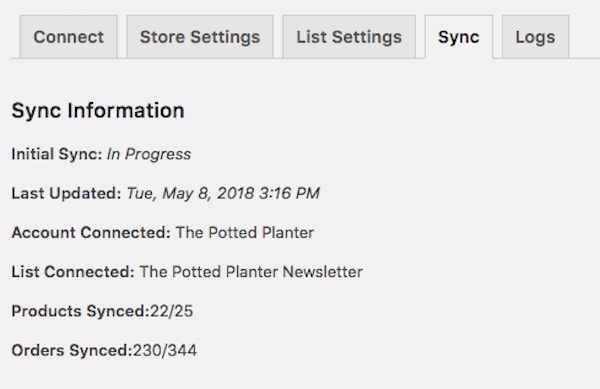 To connect your WooCommerce store to a Mailchimp audience and configure your settings, follow these steps. In your WooCommerce Dashboard, click the Mailchimp icon. On the Connect tab, enter your Mailchimp API key and choose whether you want to send us your debugging logs. To learn how to generate a Mailchimp API Key, read About API Keys. If you later decide to switch Mailchimp accounts and use a different API key, you'll have to deactivate and delete the plugin, then re-install it. 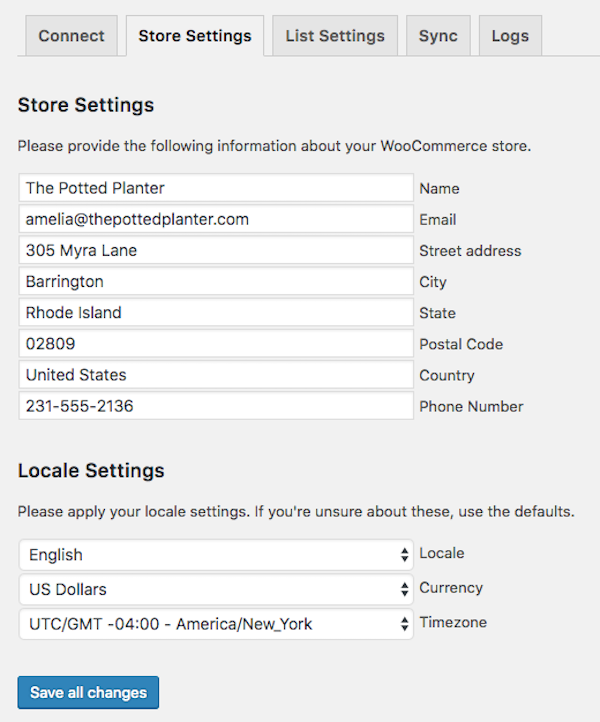 Enter the Store Settings and Locale Settings for your WooCommerce store. Choose the audience you want to sync with your store, and whether to auto-subscribe existing customers. If you later decide to switch audiences, you'll have to deactivate and delete the plugin, then re-install it. 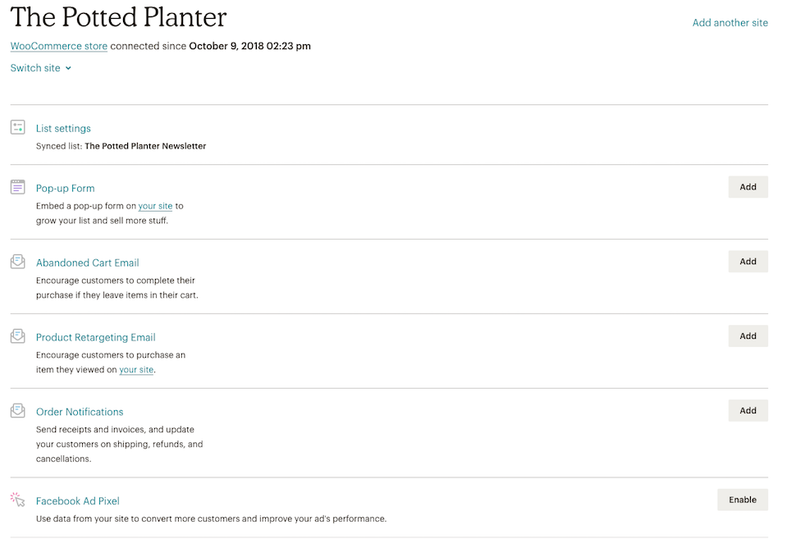 If you have no audiences in your Mailchimp account, you can create a new audience on the List Defaults tab. Set your defaults, and click Save all changes when you're done. We'll create a Mailchimp audience for you. Enter the subscription opt-in message you want customers to see at checkout. Next, choose a checkbox display option. To follow best practices for a permission-based audience, we recommend Visible, unchecked by default. To change the location of the opt-in checkbox at checkout, enter one of the available WooCommerce form actions. All set! We'll start syncing your WooCommerce customers to Mailchimp. This takes about an hour for every 5,000 orders in your store. To view our progress, check the Sync tab. If you have issues with your connection, you can resync your audience without losing any e-commerce data. To resync your audience, click the Resync button. 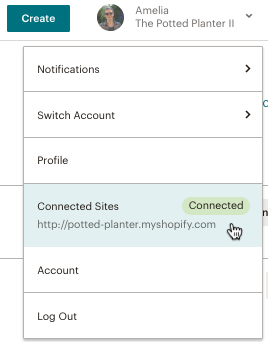 After you connect Mailchimp for WooCommerce, you can visit the Connected Sites page in your account to view the details for your WooCommerce store. You'll be able to see the status of the integration or add and manage e-commerce features. To view your WooCommerce site details, follow these steps. From here, you'll be able to view your synced audience, design a pop-up form, or send and monitor e-commerce automations that use data from your connected WooCommerce store. After the sync is complete, you'll have access to all of Mailchimp's powerful e-commerce features. Create purchase-based segments to use with targeted campaigns. Send receipts, invoices, shipping confirmations, and more with our Order Notifications automation. Add Product Recommendations to Abandoned Cart emails. Add a customized pop-up signup form to your WooCommerce site. Find out everything Mailchimp has to offer in our article, Sell More Stuff with Mailchimp. For the latest features and best performance, make sure to use the most up-to-date version of Mailchimp for WooCommerce. To update Mailchimp for WooCommerce, follow these steps. In the left navigation panel, click Plugins, and choose Installed Plugins. Find the Mailchimp for WooCommerce plugin. If you see a new update notification, click update now. If you don't see a notification, click Check for updates, then click update now. Great job! Now you have the latest version of Mailchimp for WooCommerce.. If you have problems with your store connection, you may want to deactivate and delete Mailchimp for WooCommerce, then re-install it. To delete and re-install Mailchimp for WooCommerce, follow these steps. Find the Mailchimp for WooCommerce plugin, and click Deactivate. In the confirm delete pop-up, click OK.
After you re-install the plugin, all of your e-commerce data will be re-added to your Mailchimp account. My store won't sync with Mailchimp. If you have problems with the Mailchimp for WooCommerce data sync, and have already tried to delete and re-install the plugin, there are a few other possible causes. Your setup doesn't meet the minimum requirements. The WooCommerce plugin for WordPress requires PHP 7 or greater. We also recommend you update to the latest versions of both WooCommerce and Mailchimp for WooCommerce. You have conflicts with your Wordpress Theme or other plugins. You may need to switch themes, or deactivate all plugins except WooCommerce and Mailchimp for WooCommerce, and try again. To learn more, hop over to WooCommerce: Fixing Theme and Plugin Conflicts. My e-commerce automation isn't sending. Your store hasn't finished syncing. To see if your store has completed its sync, check its status on your Connected Sites page. I'm sending duplicate transactional emails. WooCommerce sends certain types of notification emails by default. If you use Mailchimp's Order Notifications automation, we recommend you disable the corresponding order notifications in WooCommerce so that you don't send duplicate emails to your customers. To learn more, read WooCommerce's documentation on email settings. I see duplicate store connections. Did you recently delete and re-install Mailchimp for WooCommerce in order to resolve an issue with your connection? If you see a duplicate connection afterward, you may have deleted the plugin without deactivating it, first. Repeat the process to disconnect and reconnect, and make sure not to skip any steps. I need to talk to support. If you've tried our troubleshooting suggestions, but still have trouble with your sync, contact Mailchimp Support. It's helpful to include your WooCommerce System Status Report, along with screenshots of your Mailchimp for WooCommerce plugin settings tab.